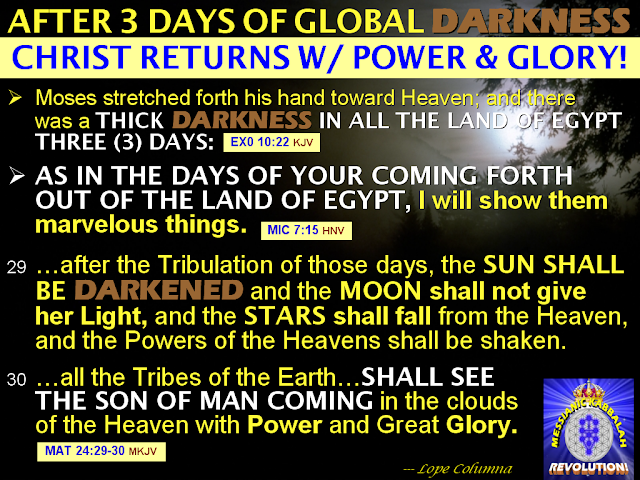 COLUMNA MESSIANIC RESEARCH CENTER: The THREE (3) DAYS OF DARKNESS DURING THE TIME OF MOSES IN EGYPT, WILL BE REPEATED IN THE TIME OF CHRIST'S RETURN IN THE MODERN EGYPT; WITH GREATER MAGNITUDE AND IMPACT! The THREE (3) DAYS OF DARKNESS DURING THE TIME OF MOSES IN EGYPT, WILL BE REPEATED IN THE TIME OF CHRIST'S RETURN IN THE MODERN EGYPT; WITH GREATER MAGNITUDE AND IMPACT! Just before the return of Christ with great Power and Glory, the Whole World will be covered with thick Darkness. All Power Plants, Light Sources, Telecommunications, and Transportation on Earth will stop functioning. The SOLAR STORMS from the Sun and the Electromagnetive Pulse (EMP) produced from Nuclear Bomb explosions and Electromagnetic Pulse Weapons will destroy all electronics and microchip technologies. This means that all Satellites, Power Plants, Vehicles & Cars, Computers, The Internet, Cell Phones, Appliances, etc. will be useless as they stop functioning. 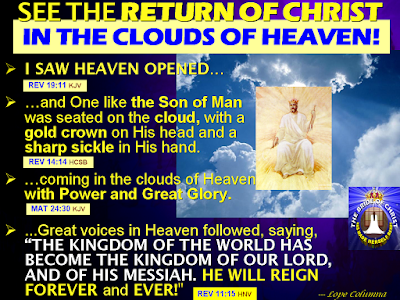 THE GREAT ECLIPSE AND TOTAL BLACKOUT IN THE FIRST REDEMPTION WILL BE REPEATED IN THE FINAL REDEMPTION AT THE RETURN OF CHRIST; WITH GREATER IMPACT! During the First Redemption, with Moses in the superpower Nation of Egypt, God caused the three (3) Days of Darkness (Exodus 10:21-23). With these super-natural events, God destroyed Egypt; but saved and gave birth to the Nation of Israel, which are the former slaves of Egypt. The great eclipse that happened in the First Redemption with Moses in the superpower nation of Egypt will be repeated in the soon-coming Final Redemption or Exodus with Christ Jesus (Micah 7:15-16). The whole world today is also an Egypt-type environment. And since the Final Redemption is similar and the continuation of the First Redemption, the same Power of God (but greatly multiplied), will also happen just before the return of the King Messiah (Christ Jesus). The modern Pharaohs of today are the World and National Leaders; and their cruel staff, are the modern Egyptian Taskmasters. GOD WILL EXTINGUISH THE LIGHTS OF MINISTERING ANGELS AND PUNISH THEM TOGETHER WITH THE CORRESPONDING HUMAN LEADERS OF EVERY NATION! According to the Zohar, God assigned Ministering Angels for every gentile Nation on Earth. Only the Nation of Israel is under the direct control of God Almighty. Just before the return of the KING of Kings (Christ), God the Father will extinguish the Lights of these Ministering Angels, and punish them and the corresponding Human Leaders of every Nation => Kings, Presidents, Prime Ministers, etc. (Zephaniah 1:8). When this happens, they will all look black (Ezekiel 32:7-9). The Heavens will be colored with black, the Stars darkened, the Sun will eclipse, and the Moon, deprive of her borrowed light, will be colored with RED BLOOD. For more explanations, go to: WHAT IS A BLOOD MOON? WHAT DOES GOD SAY ABOUT THE COMING GREAT ECLIPSE => Announcing Christ's Glorious Return? How Can You Escape Its Associated Terrifying Events? ALL THE HEAVENLY AND EARTHY POWERS AND LIGHT MUST GIVE WAY TO THE GLORY AND LIGHT OF THE COMING KING MESSIAH! At the glorious return of Christ, the Sun, Moon, and the Stars will give way, and their Lights will be taken away from them. And every one on Earth must be silent (Habakkuk 2:20)! ALL ELECTRONICS AND MICROCHIP TECHNOLOGIES WILL BE DISABLED. THIS MEANS ALL POWER PLANTS, TELECOMUNICATIONS, TRANSPORTATIONS, AND APPLIANCES WILL STOP FUNCTIONING! All Power Plants, Light Sources, Telecommunications, and Transportation on Earth will stop functioning. The SOLAR STORMS from the Sun and the Electromagnetive Pulse (EMP) produced from Nuclear Bomb explosions and Electromagnetic Pulse Weapons will destroy all electronics and microchip technologies. This means that all Satellites, Power Plants, Vehicles & Cars, Computers, The Internet, Cell Phones, Appliances, etc. will be useless as they stop functioning. THE 3 DAYS OF DARKNESS ANNOUNCE THE DISPLAY OF THE LORD GOD'S GLORY AND HIS REIGN AS THE KING OF THE EARTH, HEADQUARTERED IN JERUSALEM! Know and understand those things that God hates. Then, repent and stop doing them again. Return to the LORD. Know Him intimately by studying His True Gospel of Messianic Kabbalah Wisdom. Better still, support and participate in His Great End-Time Work. All this you can do before God cause the Global Total Darkness.